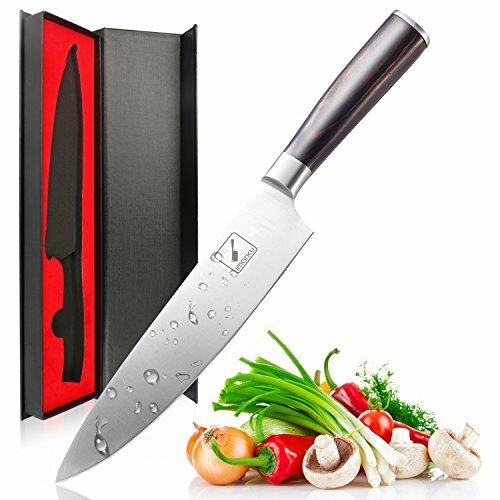 The Imarku 8-inch knife is designed for professionals who include chefs,culinary experts, food caterers as well as an ordinary person.It is a multipurpose knife that is ideal for various tasks which include cutting, chopping, dicing and slicing vegetables, fruits, fish, meat and other products. It is also ideal for removing flesh from bones as well as pounding /smashing garlic. The knife is crafted using German engineering and features a toughened stainless steel blade that measures 8-inches. This 2.3 mm thick blade consists of approximately 0.6%-0.75% carbon for added strength and durability. The length of the handle is 5 inches giving the knife an overall length of 13 inches. To ensure the knife is resistant against rust/corrosion and won't rust, the steel blade also consists of 16-18% chrome material. Being a multi-functional knife, the Imarku 8-inch chef's knife is suitable for most cutting applications in the kitchen. It is also quite classy thanks to its design and chrome-finish.